On paper, the Moto G defies all expectations for what an entry-level smartphone should look like. An attractive design, a bright 720p touchscreen and a 5-megapixel rear-facing camera, all for $179. It just doesn’t add up. Somewhere, there needs to be a compromise. The idea of a mid-range Android handset coupled with a low-end price tag is awfully compelling. 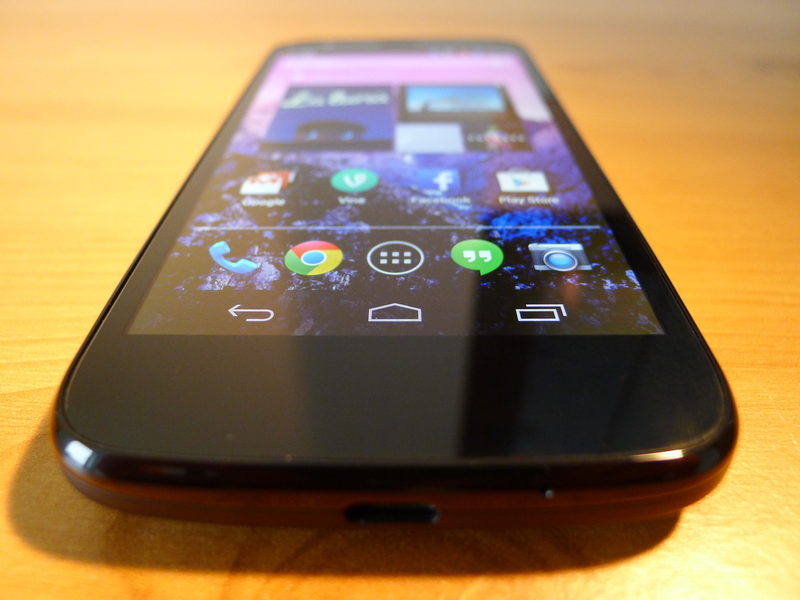 While the Nexus 5 (our review) offers sublime value as a high-end, off-contract handset, it has its quirks and is still too expensive for most first-time smartphone buyers. The Moto G, meanwhile, could be for everyone. A device that your parents and grandparents would buy. The cheap smartphone that passes the time until your next upgrade. The back-up handset for when you drop your daily driver in the kitchen sink. It’s cheap, but the potential install base for such a handset is huge. 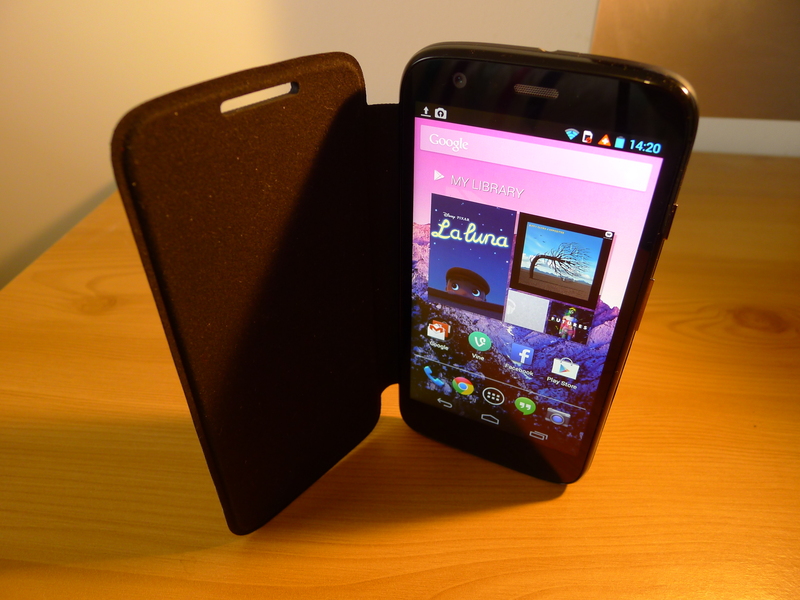 The design of the Moto G is similar to the Moto X, albeit diminished to accommodate for its smaller 4.5-inch display. In an age where 5-inch and 6-inch smartphones are the norm, it’s refreshing to pick up a handset with such a petite form factor. The curved back is comfortable in the palm of your hand and you can access nearly every part of the display without adjusting your grip. 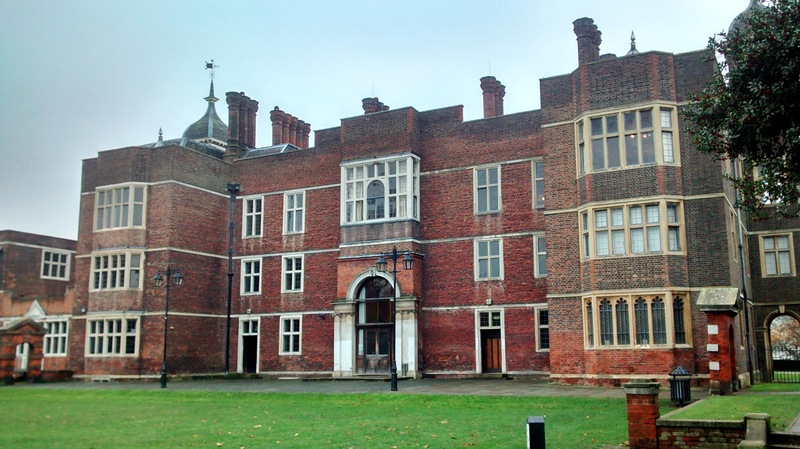 To use the rather well-worn cliché: They just don’t make them like this anymore. The soft-touch plastic back is pleasant enough and doesn’t pick up smears or greasy fingerprints after extended use. It doesn’t feel like the most rugged handset in the world, but I’m confident it would come away unscathed from the odd drop or knock. The hardware buttons are easy to reach and have a satisfying click when you press them. Without looking at the device though, it can be difficult to know whether you’re turning the volume up or down. It’s a minor detail, but a tapered volume rocker makes a huge difference when you’re listening to music on the move. 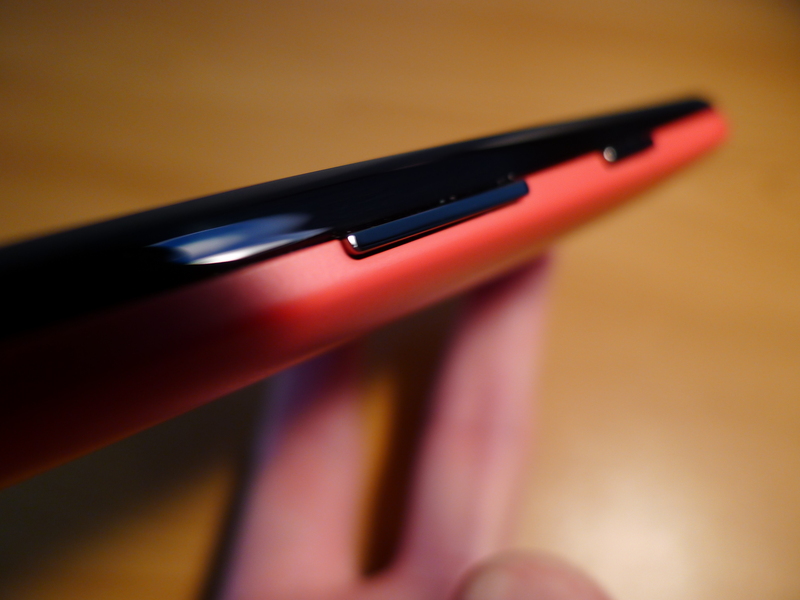 The curvature of the Moto G also makes it look a little thick in the middle. 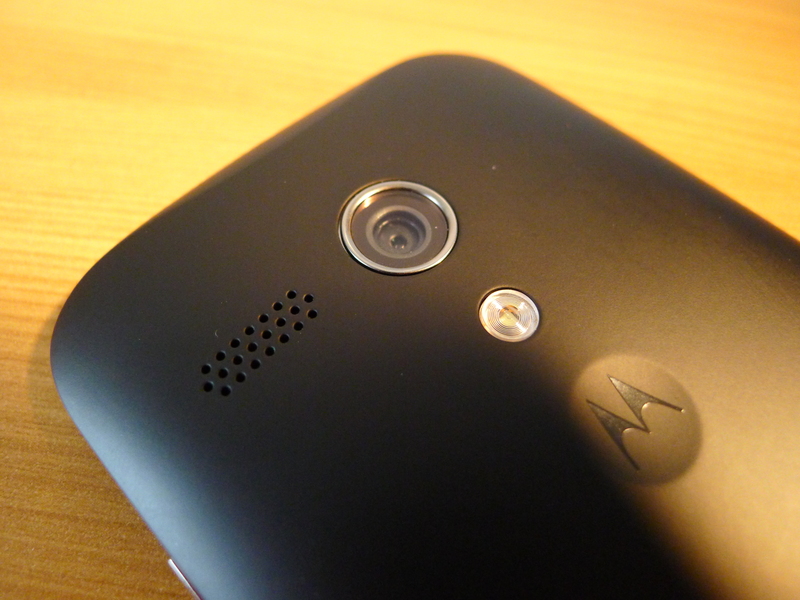 It’s not off-putting, but it’s certainly noticeable whenever you see the Moto G in profile. 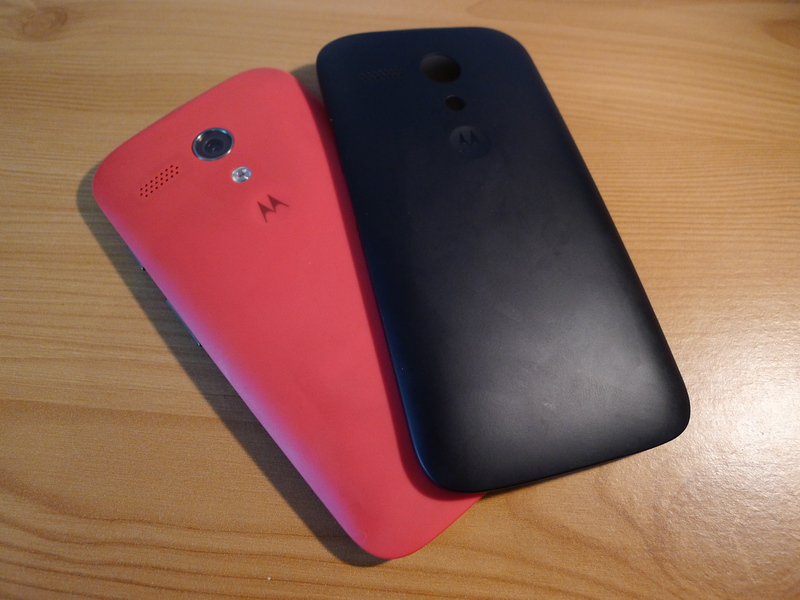 (In all likelihood, this was inevitable due to Motorola’s choice of internals.) 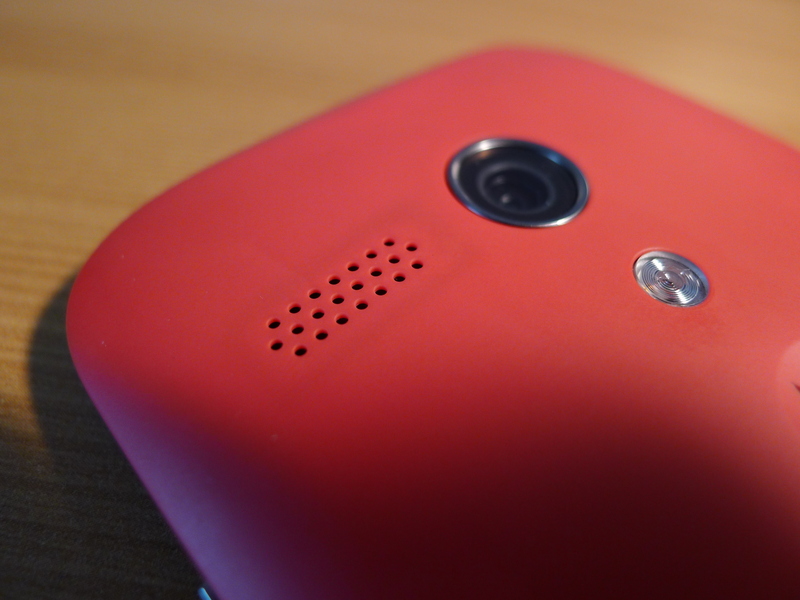 As with the Moto X, you’ll find a recessed Motorola logo on the back of the device. It’s small and inconsequential, but I found that my index finger would naturally rest there in one-handed use. It feels comfortable and inviting, similar to the groove in your sofa. 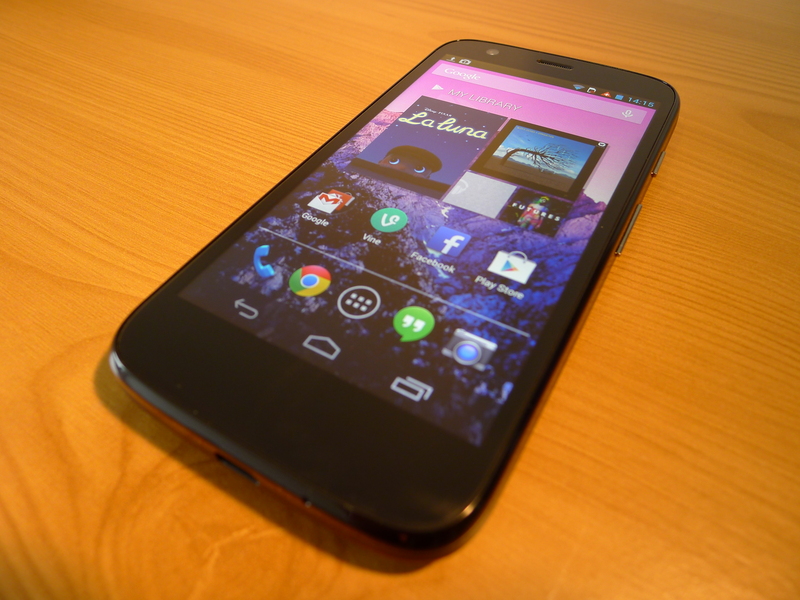 From a design perspective, the Moto G is a good-looking phone. It’s not stunning or particularly original, but it’s enough to make it memorable. Most smartphones follow the same design template pioneered by the original iPhone in 2007: Keep physical hardware buttons to a minimum, adopt a large touchscreen display and make the body as thin as possible. Many considered the Moto X to be quite distinctive when it debuted earlier this year, if only because it disrupted these uniform black, silver and white slabs with some novel customization options. The Moto G doesn’t go quite as far, opting for a series of swappable back covers that come in a variety of different colors and form factors. Colored Shells are pretty self-explanatory, while the textured flip-covers give the device a more sophisticated feel for enterprise customers. Grip Shells, meanwhile, offer a rubberized frame for those of us who are prone to dropping our smartphones on an all too frequent basis. None of these are particularly novel, but the choice of colors and textures is outstanding. Each shade feels vibrant, contemporary and unique, giving the Moto G a sense of artistry that is rarely found in an Android smartphone. Unlike the Moto X, these basic customization options won’t sell the Moto G. None of them are bad, per se – official, premium cases are always welcome – but it’s not going to be the feature that sells the device, unless Motorola chooses to emphasize it pretty heavily in its marketing. To keep costs as low as possible, most entry-level Android smartphones are fitted with a truly awful display. 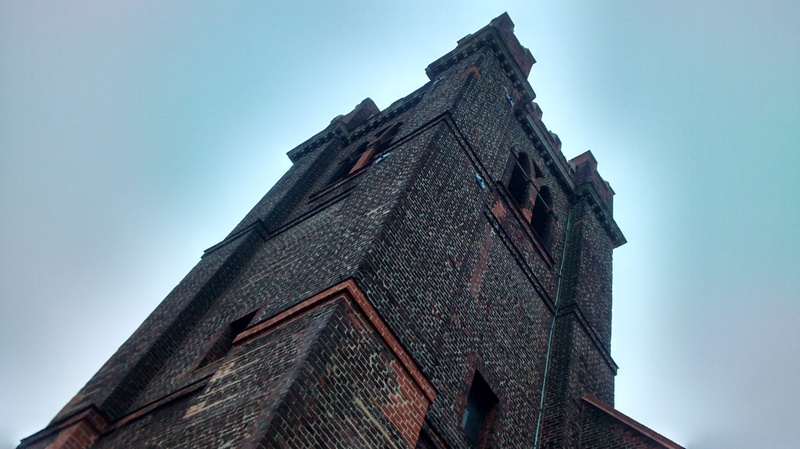 They’re notably dim or low-resolution, detracting from the rest of the hardware and Google’s mobile operating system. Thankfully, the Moto G avoids both of these problems with a bright, responsive and pixel-dense screen. It’s set at an impressive 720p resolution, which is more than enough for the handset’s 4.5-inch display. At 329 pixels-per-inch, the Moto G serves up icons, apps and text with razor-sharp clarity and detail. While it’s true that this isn’t a 1080p display, at this sort of form factor I don’t think it would have made much of a difference. The automatic brightness setting was a little conservative for my tastes, dialling back the luminosity to a point where I often had to squint see what was happening. If you take control and ramp the slider up though, the display shines in almost all lighting conditions, including direct sunlight. Contrast and color representation is also impressive, serving up some pure whites and deep, rich blacks without fault. For reading ebooks or editing photos and video on the move, the Moto G is a solid choice. The single rear-facing speaker on the Moto G is loud and punchy, providing plenty of clarity for hands-free calls. The handset struggles with low-end audio though, so don’t expect it to pump out the Inception soundtrack or the basslines in your favorite album very well. Some light YouTube and music playback is fine here, but you’ll need a pair of headphones or an external speaker for any serious listening. For all intents and purposes, the Moto G runs a stock build of Android 4.3 (Android 4.4, or KitKat is expected to roll-out in January.) Motorola has made a few additions, such as the Assist app and Camera app, but it’s mostly identical to that found on a Nexus device, or the Google Play Edition Samsung Galaxy S4 and HTC One. That is wonderful. Entry-level Android smartphones need all of the power and storage they can muster, because they’re often weighed down with terrible skins and a tonne of bloatware developed by the manufacturer. To be able to just set the device up and begin using it right away is bliss. Unlike other Android smartphones, I didn’t need to spend any time rooting the Moto G or downloading any third-party app launchers and widgets. From the moment I turned it on, I was satisfied with the user experience. Unlike the Moto X, the Moto G doesn’t support Active Display notifications. The omission is a trade-off that Motorola has made for picking an LCD display over an AMOLED alternative and here, its presence is sorely missed. The ability to quickly glance at an alert and see a glimpse of the content (without fully waking the device) was considered to be a unique feature for the Moto X. Hopefully, Motorola will bring it back for future devices. The Moto G is also missing the always-on listening mode for Google Now, although I didn’t find this to be a problem. On the Moto X, I imagine this feature might be useful if I were cooking or carrying some groceries, but those specific use-cases are few and far between. 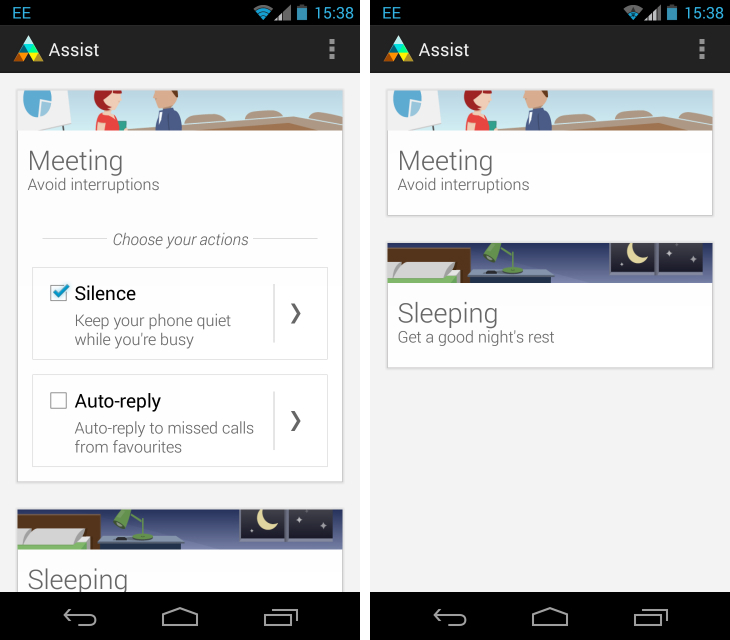 The device does carry the Assist app though, which emulates the Do Not Disturb setting found on the iPhone. It keeps the Moto G on silent when you’re sleeping and during meetings that you have scheduled in your calendar app. Assist doesn’t carry the driving mode found on its predecessor though, which turned out to be an unexpected joy for many Moto X owners. At such a low price-point, it was inevitable that Motorola would make some compromises. 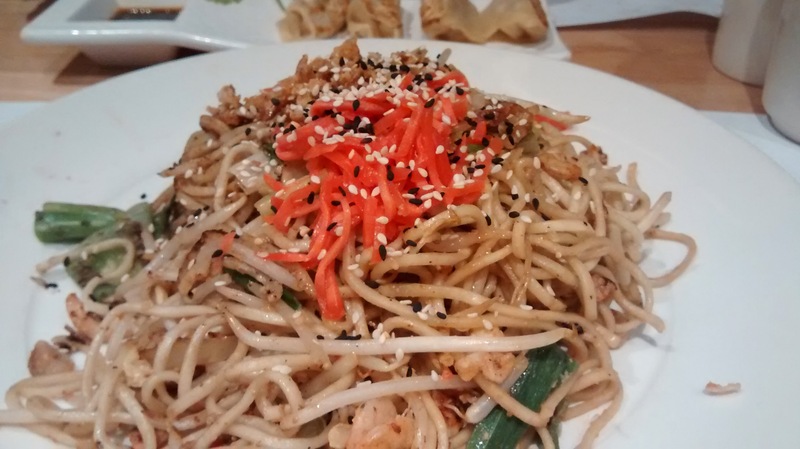 In the case of the Moto G, it’s the camera. The 5-megapixel rear-facing shooter is underwhelming. Even in optimal lighting conditions, the Moto G often struggled to focus on anything that was closer than a few feet away. Scenes were often recorded with a tremendous amount of noise too, which made me embarrassed to share them anywhere on the Web. In short, this is not a reliable or versatile camera. The Moto G ships with Motorola’s own Camera app, which is aimed squarely at beginners who want want to capture photos quickly and with a simple control scheme. It succeeds in this regard by hiding all of the basic camera settings. Just tap anywhere on the screen and the Moto G will fire a shot; the focusing and exposure is configured automatically. Flash, HDR, panorama and tap-to-focus are all accessed from a radial menu that you swipe in from the side of the screen. It’s a little slow and unresponsive, but the interface is intuitive and pleasant enough. Video is a similar story. The 720p files that the Moto G spits out often contain an unacceptable amount of noise and shallow, inconsistent audio from the built-in mic. Fine for the occasional Vine or Instagram video, but useless for creative types and aspiring filmmakers. The Moto G packs a quad-core, 1.2GHz Qualcomm Snapdragon 400 processor coupled with 1GB of RAM. It’s unbelievable that a handset at this price-point is offering a quad-core experience, although it’s offset somewhat by the low-powered chipset. The performance can be wrapped up in a single word: Surprising. From the moment you boot it up and begin cycling through the app drawer, the Moto G exceeds expectations. 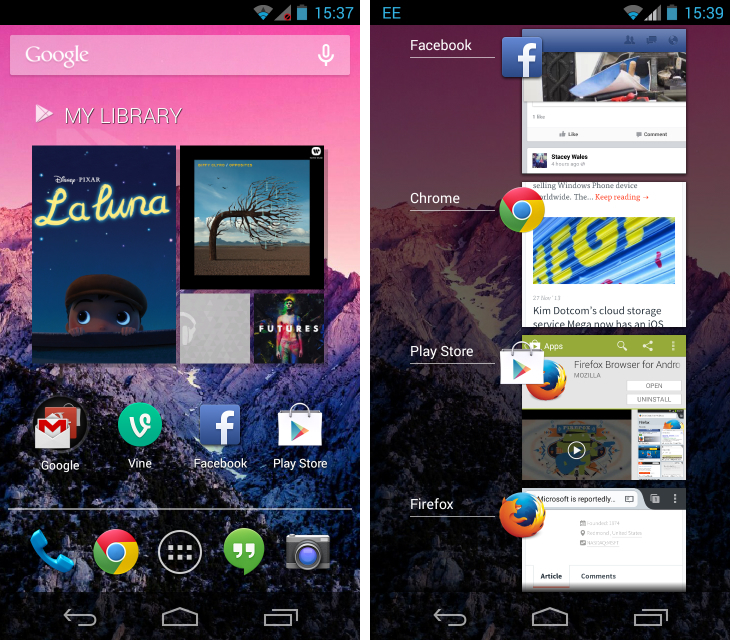 Launch a handful of apps, cycle between them and then take a couple of calls, and the handset will perform beautifully. For the average consumer, this is a very capable and reliable device. Power users will be able to push the device beyond its comfort zone though. At one point I was streaming from Google Play Music, uploading some photos to Google+ and juggling a few other apps including Gmail, Twitter and Circa. After bouncing between them all for the better part of 15 minutes, there was a noticeable slow-down in performance. Web browsing, unusually, was also a low-point for the Moto G. Loading webpages was fine, but scrolling was ropey in a number of Android browsers including Chrome and Firefox. Without a 32GB flavor, the Moto G’s storage options are another point of contention. The 8GB base model fills up fast when you consider the space taken up by the operating system and the apps that come pre-installed on the device. The Moto G doesn’t offer a microSD slot either, so if you’re worried about storage in the long-term, the 16GB variant is essential. 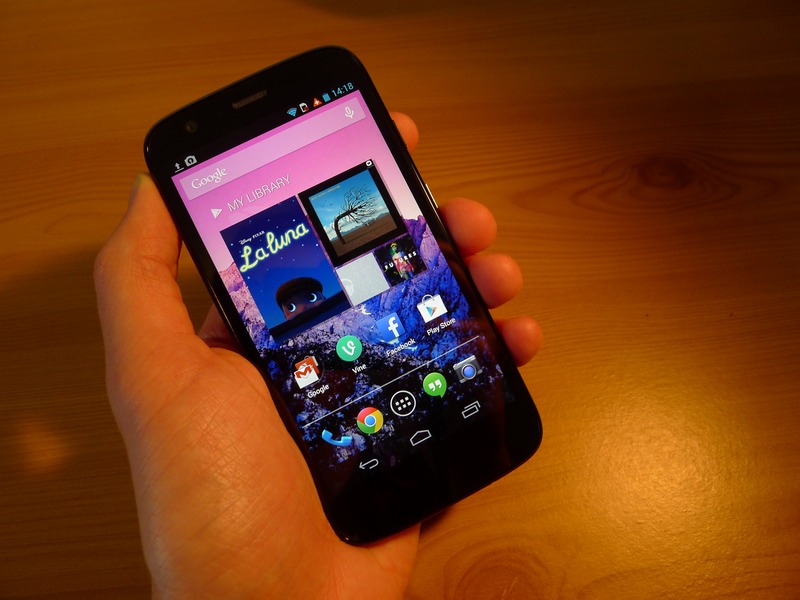 The second major compromise for the Moto G is its inability to support 4G networks. Motorola is aiming the handset at a global market and as such, many of its target audience won’t be on a 4G network or data plan anyway. Even so, LTE is becoming cheaper and far more prevalent on the global stage. Within a couple of years, I worry that the device will feel terribly outdated because of this decision. Personally, I feel the added-value of an LTE chip would have been worth the corresponding price bump, if only to make the Moto G a little more future-proof. But alas, I’m not in charge of Motorola. The Moto G has been designed from the ground up to optimize battery life. The device has a non-removable 2,070 mAh battery which is serviceable, given the size and choice of components. In my experience, the Moto G would usually last an entire day, or at least the hours when I was awake. There were times when I would need a charger in the early part of the evening, but if you’re just a little bit conservative you should be able to get through the day without seeing red in the status bar. The value proposition for the Moto G is incredible. It’s not the most powerful device on the market, but it’s well-made, reliable and devoid of all the awful bloatware and sub-part components that usually plague low-end smartphones. At the moment, the Moto G comes in at £135 for the 8GB model and £160 for the 16GB variant in the UK. The smartphone is also arriving in the US next month starting at $179 for the 8GB model and $199 for the 16GB flavor. The underwhelming camera and lack of LTE is a shame, but otherwise this is a great performer. The near-stock Android experience is fantastic, the display is gorgeous to look at and in my opinion, it’s a bit of a looker too. If you’re in the market for a cheap, capable Android smartphone, look no further. The Moto G is your best option by far.